Let us start with a short refresher from the Scrum Guide. According to the Scrum Guide, a “Sprint Review is held at the end of the Sprint to inspect the Increment and adapt the Product Backlog if needed. During the Sprint Review, the Scrum Team and stakeholders collaborate about what was done in the Sprint. Based on that and any changes to the Product Backlog during the Sprint, attendees collaborate on the next things that could be done to optimize value.” In other words, the sprint review is not a demo but a crucial event to figure out what the next steps are: are we still on the right track? (1) More time is desired to accomplish the sprint goal. That is a bit too late. The scrum team needs to re-negotiate with the product owner if they recognize mid-sprint that they might miss the sprint goal.) (2) There is “nothing to show.” (Has really nothing been DONE? My take: This is precisely the moment to have a sprint review! Besides, it is a misperception that the team can only show frontend tasks. In my experience, you can show APIs, too, even at the command line level — give it a try and be surprised. The second episode covers the metric-driven reporting session. Here, the team demos every task accomplished, and stakeholders do not take it enthusiastically. Remember, we are not accountants. Having a detailed report on what issues the money was spent does not make our customers happy. There is no justification needed, think of sunk costs — the money is gone. Instead, we are interested in the learning: are we still on the right track? Or do we need to change? My tip: Tell a compelling story at the beginning of the review to engage the stakeholders and leave out those tasks that are not relevant to the story. The fourth episode covers side-gigs of the engineers. The development team increases the scope of the sprint – without prior consulting of the product owner — by adding unnecessary work to sprint backlog items; also referred to as scope-stretching or gold-plating. This ignorance may result in a questionable allocation of resources. My take: The developers and the product owner need to talk more often with each other. If the product owner is not yet co-located with the development team, now would be the right moment to reconsider this situation. Also, is there enough slack-time for the engineers? Probably, they just wanted to test new technology and got carried away. You may want to make experimentation official in future sprints. The fifth episode covers absent developers. It is always the same few members from the development team who participate in the sprint review. The problem is that fewer participating development team members result in a reduced level of transparency. A reduced level of transparency on the engineering side may result in a flawed inspection of both the product increment and the product backlog. It may also result in an inferior adaptation of the product backlog. However, the challenge is that you cannot enforce the development team’s participation either, though. Instead, make it interesting enough that everyone is eager to participate in the sprint review. The eleventh episode covers the selfish product owner. Let me put it this way: there is no “I” in “team.” The Scrum team wins, the Scrum team loses. The Sprint review is a rather moment to shine for the development team and surprise customers & stakeholders. It is not a show to praise the product owner. The twelveth episode covers the broadcasting product owner. The sprint review is a regular, repeating opportunity to realign the scrum team with customers and stakeholders to answer a simple question: What are we building next? This requires collaboration from all participants, not just a product owner broadcasting decisions already made in advance. If the product owner is not seeking feedback actively, the purpose of the sprint review is missed. The last episode summarizes my dirty dozen of the Scrum Sprint Review anti-patterns: from death by PowerPoint to side-gigs to none of the stakeholders cares to attend. 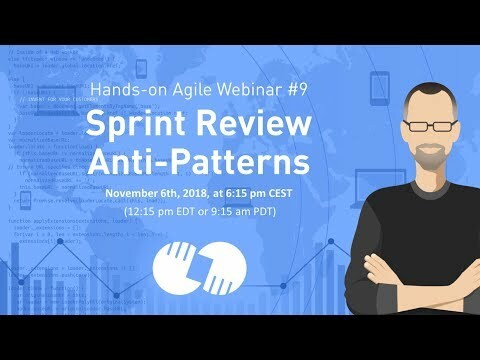 If the slide deck will not work within this browser window, please click here to browse the slide deck of the webinar Sprint Review anti-patterns directly on Slideshare. There, you will also be able to download a PDF of the slide deck.